During the 1950s, as Rispain camp was being investigated, it was mistakenly categorised as a medieval moated homestead or even a castle site. It wasn't until 1978 when the interior of the site was excavated, that it was designated an Iron Age fortified homestead. Above. Looking North West along the top of the earth banks. Above. Looking South East towards the modern day farm. The excavations of 1978, provided evidence of habitation from around 100 BC to 200 AD. The homestead's defences are incredibly well preserved. An outer ditch, now infilled, can be traced from aerial photos, but the exterior bank and its ditch still stand to an impressive height and depth. Above. 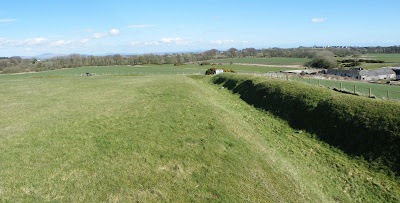 Looking South West from inside the earthworks. The 1978 excavations threw up evidence of a timber gateway on the North East side of the earthworks, with evidence of a wooden palisade running along the top of the exterior earthen bank. This was obviously a very well defended homestead. Above. Standing on the causeway at the North Eastern end. in the farm yard around a quater of a mile from the site.